Media captionJeremy Hunt: Airbus is "completely inappropriate to make these kind of threats"
But Edwin Morgan, director of policy at the Institute of Directors, said: "Business leaders have every right to speak up about their needs and concerns as we approach incredibly significant negotiations for the future of this country. "Firms think very carefully before sticking their heads above the parapet, so they should be listened to by politicians, not dismissed. Companies have to honestly assess the risks they face, and spelling them out should never be brushed off as a 'threat'." Last week BMW UK boss Ian Robertson said he needed to know within months what the government's preferred position was on customs and trade post Brexit. BMW makes the Mini and Rolls Royce and employs about 8,000 people in the UK. The customs union brings together the EU's 28 members in a duty-free area, in which they pay the same rate of duty on non-EU goods. Prime Minister Theresa May has ruled out staying in the customs union after the UK leaves the EU on 29 March 2019. Airbus, in its Brexit "risk assessment" published on Thursday, said if the UK left the EU next year without a deal - leaving both the single market and customs union immediately without any agreed transition - it would "lead to severe disruption and interruption of UK production". The European plane-maker said the warning was not part of "Project Fear", but was a "dawning reality". The term "Project Fear" has been used by some pro-Brexit campaigners to denote alleged scaremongering by those in favour of remaining in the EU. "Airbus have been one of the first companies to stick their head above the parapet and explain how distressing and how worrying the government's current direction of travel is," Labour's shadow business secretary Rebecca Long-Bailey told BBC Radio 5's Pienaar's Politics. She said she had been told in private meetings with UK business leaders that if the government went into a "no deal" Brexit scenario "it would finish them and they would have to close their sites". Airbus's 14,000 UK staff are employed across 25 manufacturing sites. About half are in Wales and it currently has more than 4,000 suppliers in the UK. "Companies are right to say that if there's no deal that won't be good for Britain, but it won't be good for Europe either," International Trade Secretary Liam Fox told Sky News. "The point I make to them is that they should also be making the same case to European governments that that will be bad for them." Mr Hunt was also asked how the government would fund its pledge to put an extra £20bn into the NHS. He said "all will be revealed" in the Budget later this year. The health secretary refused to rule out scrapping the Conservatives' 2017 manifesto pledge to cut corporation tax to 17% by 2020. "We are committed to our manifesto but we also said in our manifesto is that we want our public services to be the best in the world and that the NHS is the most important of all those public services," he told Andrew Marr. Pressed on whether he could guarantee to business people that the planned corporation tax cut would go ahead, he said: "What business people want is a sensible Conservative government". He urged them to wait for the next Budget to find out what taxes would go up. Two years ago the government promised to cut corporation tax to an all-time low of 17% by 2020. That would have given Britain one of the lowest rates of tax on company profits in the G20, and was warmly welcomed by businesses. Now that promise may be in jeopardy. The health secretary declined to confirm that the cut in corporation tax would proceed, now that the NHS has been promised an extra 3.4% in spending (in real terms) from next year. He also said that higher (and not lower) taxes would be needed to pay for the additional money on health spending. More worrying for companies has been the change in tone from senior Government ministers towards them. 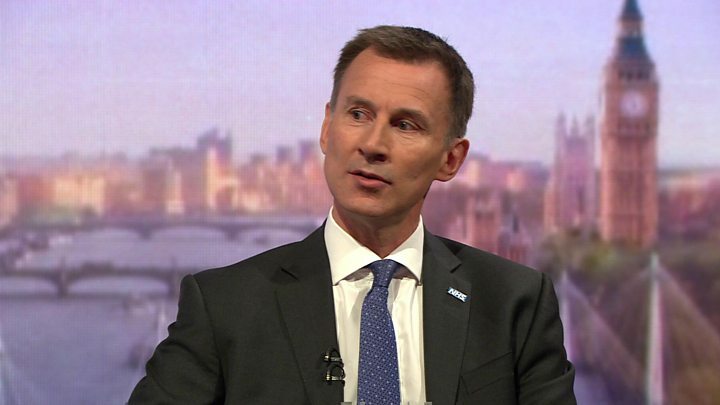 Jeremy Hunt described businesses who express concern about progress in the Brexit talks as "completely inappropriate" and "siren voices".